Duane Laflin's new teaching series on silk magic. The intent it is to create a college level of instruction about working with silk for magical purposes. 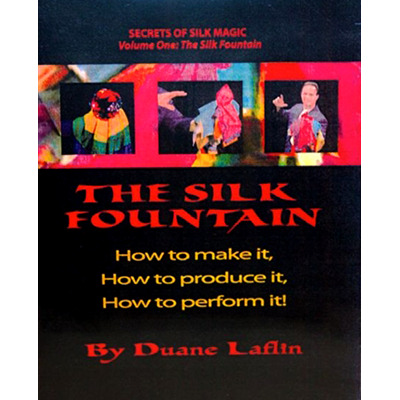 This is the first program in Duane Laflin's new teaching series on silk magic. We are happy that you can now own this on Download! Here is a program that teaches you the most important secret in silk magic. The handkerchief ball is a powerful gimmick, when you know how to use it properly. This program teaches you everything you need to know about the use of a modern metal hank ball. On This Download you will learn - How to use the hank ball for silk Productions, Vanishes, and Changes! You will see how to secretly transfer the Hank Ball from hand to hand. Learn 20th Century silk effects, complete routines and even how to use the hank ball with Sponge Balls. This is volume three on the series of "The Secrets of Silk Magic" By Duane Laflin. Learn how to use a gimmick that is so "old it is new." A palmo opens the door to many clever possibilities in silk magic. What is a palmo? A barrel shaped dye tube that will hold two eighteen inch silks at the same time. It allows you to do a double switch with large silks without switching out gimmicks. Open the door to a world of possibilities with many routine ideas using this great gimmick. Learn a routine where a red scarf turns white and then red again in the bare hands of the magician. There is plenty of funny business involved as the magician offers to "explain" how this trick is done. The "explanation" is even more baffling than the trick itself. The regular audience will love the routine. It also will fool magicians! This is a full hour of instruction. At this point in time this is the only video in existence that teaches the proper use of this gimmick. In this one hour program you will learn how to steal it away, secretly switch it from hand to hand, properly load it with silks, and use it for color change effects, appearances, vanishes .